The first village hall was a wooden building which had been erected in 1920 financed partly by the estate of Viscount Allendale and partly by public subscription. It was not a new building, having been used previously as a hut for prisoners-of-war at Silkstone. It was cut up in sections, removed to West Bretton and re-erected on a site that was used as a recreation ground, but which previously had been a croft attached to the former farm buildings which lie immediately to the south. The village hall, referred to as the Institute, was planned to be part of the village's memorial to those men from the village who had been killed during the First World War. The surrounding grounds were laid out with tennis courts and bowling green in 1925. However the village hall was destroyed by fire on Friday 21 June 1957. The opening of the current village hall, following the fire, took place on 9 April 1958, after a swift and successful fund-raising effort. In 1974, after a long period of neglect, the bowling green and tennis courts were restored and renovated. Although the bowling green continues to this day with a thriving bowling club, the tennis courts fell into disrepair. 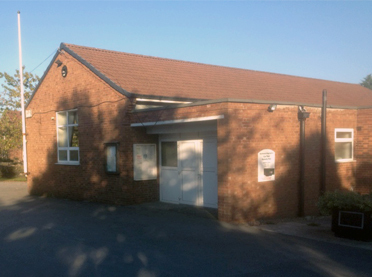 The village hall comprises a main hall with stage, a committee room and a kitchen. There is also a bar available which opens regularly for the benefit of all residents. Various groups use the village hall and the rooms, and bar, which are also available for private hire. The hall is surrounded by a car park which is of benefit not only to visitors to the village hall, the bowling green, and the church, but also benefits local residents by reducing or removing the need for on-street parking. The car park plays an important role in the local primary school's ‘park & stride’ scheme which allows parents to park in the car park and walk their children to and from the village school. The former tennis court is used as an overflow car park. The village hall and surrounding grounds are run by Bretton Memorial Institute, whose governing document is the Trust Deed made on 27 November 1934. It is registered with the Charity Commission reference number 523524. It is a qualifying club and has a Club Premises Certificate under the Licensing Act 2003 which authorises the Institute to sell or supply alcohol and provide regulated entertainment. The original Anglican Chapel was built by Sir William Wentworth in 1744 and fitted out at his own expense and " generously maintained an officiating minister of the Church of England" for the Chapel. It was dedicated to St Bartholomew and remained as a private chapel until 1958 when it was given to the village and used by Bretton Hall College until the 1990's. At this time it was sold to Bretton Hall College. Methodists worshipped in a 19th Century estate building which was originally built for Protestant Dissenters. This Methodist Chapel began to be used by both Anglicans and Methodists together in the late 1970's. In 1982, the Church in West Bretton was formed as a Local Ecumenical Partnership. The building used today by the Church in West Bretton in Huddersfield Road was the former Methodist Chapel which was remodelled in 1995. Services are held on Sundays at 10.30am except on the second Sunday in each month when the time is 9.15am. This service is conducted by the Rev Philip Bee, Methodist Minister. From April to September if there is no service at West Bretton, members may choose whether to worship at St Peter's Church, Woolley or Clayton West Methodist Church, both services being at 10.30am. Visitors to the area are most welcome to attend.